This admission by the author—surely meant to be cheeky, like much of the book—points to the trouble of retelling Jane Eyre as Jane Slayre, which is that Jane Eyre was scary enough without adding actual vampyres, zombies and werewolves to the text. In contemporary discourse, JaneEyre is often portrayed as romantic, whereas a close reading of the novel reveals it to be, like Emily Bronte’s Wuthering Heights, a work of Victorian Gothic: Jane is a tragic figure, brought up by the cruel and neglectful Reed family, finding herself sent off to the repressive Lowood School. Even as the governess of Thornfield Jane is tortured by strange happenings, and her relationship with Mr. Rochester is not reconciled without considerable pain on the part of both parties. It is strange, then, that Browning Erwin found it necessary to painstakingly turn the Reeds into vampyres, the Lowood School into a facility for zombie servants, and Mr. Rochester’s secret wife into a werewolf. These characteristics, though not so specifically, are practically implied in Jane Eyre. What need is there to dial up the ferocity of a book that already features ghosts and a madwoman locked in an attic? Perhaps the new version is more exciting, or more visually stimulating to the mind’s eye, but it is completely without the subtlety and suspense that have, no doubt, played a great role in solidifying Jane Eyre as a timeless work of English literature. Jane Slayre is not the only book of this kind to have been published recently; there also exists Pride and Prejudice and Zombies, Little Vampire Women, and Sense and Sensibility and Sea Monsters, among others. 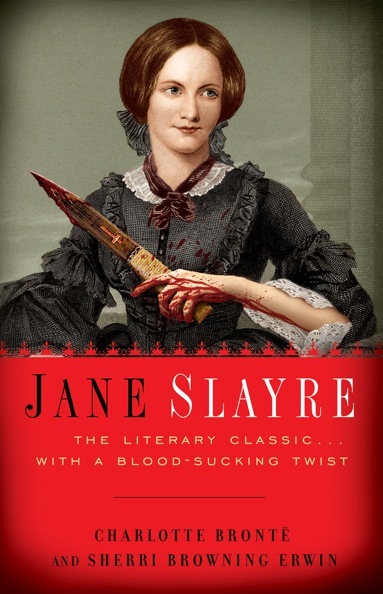 Not all are written by Browning Erwin, and Pride and Prejudice and Zombies has by far been the most commercially successful of this new genre; however, it seems somehow that Jane Slayre, by merely existing, commits the greatest offense. Unlike the monsterized lighter works of Jane Austen and Louisa May Alcott, Jane Eyre need not be altered to be dark and horrible. Stranger still is Browning Erwin’s introduction of the zombie into Victorian England, as the zombie is primarily a West African invention, which has since been co-opted and revived by American culture. The history of the contemporary zombie is largely based in the lore of voodoo practice once attributed to African American slaves. The zombie as a psychological concept was originally used to illustrate the otherness of those that were not white; however, Browning Erwin uses it, with some success, to play on the relevant issues of class and social standing in Jane Eyre. Browning Erwin’s use of the zombie to exaggerate the original novel’s questions of class is the book’s one serious undertaking; however, this task is often undermined by the absurdity of the text itself: Jane, for example, slays vampyres with a “stake-o-matic.” For the most part, Jane Slayre is written in the style of the original, and Browning Erwin does quite well in replicating Bronte’s tone and style, but additions like the “stake-o-matic” do a great injustice by reminding the reader that yes, this is a model of a great work, and not a great work with unique merit and value. But if this, like the afterword suggests, is a tool meant only to coax students into once again embracing Bronte’s writings in a time when they must compete with the Twilight and Harry Potter series, then I must support Browning Erwin’s endeavors. The original Victorian horrors seem to have failed to capture the attention of most young readers, and so authors and teachers have been forced to look elsewhere. If you are a thoughtful reader hoping for the continued longevity of 19th century English fiction, Browning Erwin’s strategic appeal to new audiences is enough to bestow Jane Slayre with inherent worth. If guided by Bronte’s immaculate prose, perhaps I can bear the vampyres, zombies and werewolves that haunt her loveliest work, Jane Eyre.